The Mid-Autumn Festival is one of the few most important holidays in the Chinese calendar, the others being Chinese New Year and Winter Solstice, and is a legal holiday in several countries. Farmers celebrate the end of the fall harvesting season on this date. Erect the Mid-Autumn Festival. It is not about planting trees but hanging lanterns on the bamboo pole and putting them on a high point, such as roofs, trees, terraces, etc. It is a custom in Guangzhou, Hong Kong, etc. In Singapore, one thing almost everyone will do during mid-autumn festival, is to eat delicious mooncakes. Check out the best mooncakes in Singapore. The Mid-Autumn Festival is one of the most anticipated Chinese calendar events in Singapore. Also known as the Moocake or Lantern Festival, it is a celebration that turns Chinatown into a vibrant hub of spectacular performances and displays. On the night of the Mid-Autumn Festival Opening Ceremony, the thoroughfares are transformed into a spectacular sea of lights, lanterns and decorations. The ceremony will feature a lantern street parade and lion and dragon dances by performers decked out in colourful costumes, breathing magic into the atmosphere. 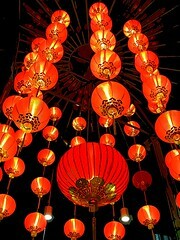 Arm yourself with a camera to capture the essence of multi-cultural performances and a dazzling display of fireworks. You can find out more at Singapore Chinatown website. You can also visit Botanic Garden in Singapore. Decorate your own mid-autumn lantern using plant materials. Enjoy family bonding through a relaxing session of tea appreciation and mooncake sampling in this workshop. Celebration of the Mid-Autumn Festival is strongly associated with the legend of Houyi and Chang’e, the Moon Goddess of Immortality. Tradition places these two figures from Chinese mythology at around 2200 BCE, during the reign of the legendary Emperor Yao, shortly after that of Huangdi. Unlike many lunar deities in other cultures who personify the moon, Chang’e simply lives on the moon but is not the moon per se.There are many variants and adaptations of the legend of Chang’e that frequently contradict each other. However, most versions of the legend involve some variation of the following elements: Houyi, the Archer, an emperor, either benevolent or malevolent, and an elixir of life.One version of the legend states that Houyi was an immortal and Chang’e was a beautiful young girl, working in the palace of the Jade Emperor (the Emperor of Heaven) as an attendant to the Queen Mother of the West (the Jade Emperor’s wife). Houyi aroused the jealousy of the other immortals, who then slandered him before the Jade Emperor. Houyi and his wife, Chang’e, were subsequently banished from heaven. They were forced to live on Earth. Houyi had to hunt to survive and became a skilled and famous archer.At that time, there were ten suns, in the form of three-legged birds, residing in a mulberry tree in the eastern sea. Each day one of the sun birds would have to travel around the world on a carriage, driven by Xihe, the ‘mother’ of the suns. Houyi was summoned away again by Emperor Yao. During her husband’s absence, Chang’e, noticed a white beam of light beckoning from the rafters, and discovered the pill. Chang’e swallowed it and immediately found that she could fly. Houyi returned home, realizing what had happened he began to reprimand his wife. Chang’e escaped by flying out the window into the sky.Houyi pursued her halfway across the heavens but was forced to return to Earth because of strong winds. Chang’e reached the moon, where she coughed up part of the pill. Chang’e commanded the hare that lived on the moon to make another pill. Chang’e would then be able to return to Earth and her husband.The legend states that the hare is still pounding herbs, trying to make the pill. Houyi built himself a palace in the sun, representing “Yang” (the male principle), in contrast to Chang’e’s home on the moon which represents “Yin” (the female principle). Once a year, on the night of the Mid-Autumn Festival, Houyi visits his wife. That is the reason why the moon is very full and beautiful on that night.This description appears in written form in two Western Han dynasty (206 BC-24 AD) collections; Shan Hai Jing, the Classic of the Mountains and Seas and Huainanzi, a philosophical classic. Another version of the legend of mid-autumn festival, similar to the one above, differs in saying that Chang’e swallowed the pill of immortality because Peng, one of Houyi’s many apprentice archers, tried to force her to give the pill to him. Knowing that she could not fight off Peng, Chang’e had no choice but to swallow the pill herself. Other versions say that Houyi and Chang’e were still immortals living in heaven at the time that Houyi killed nine of the suns. The sun birds were the sons of the Jade Emperor, who punished Houyi and Chang’e by forcing them to live on Earth as mortals. Seeing that Chang’e felt extremely miserable over her loss of immortality, Houyi decided to find the pill that would restore it. At the end of his quest, he met the Queen Mother of the West, who agreed to give him the pill, but warned him that each person would only need half a pill to regain immortality. Houyi brought the pill home and stored it in a case. He warned Chang’e not to open the case, and then left home for a while. Like Pandora in Greek mythology, Chang’e became curious. She opened up the case and found the pill, just as Houyi was returning home. Nervous that Houyi would catch her, discovering the contents of the case, she accidentally swallowed the entire pill, and started to float into the sky because of the overdose.Some versions of the legend do not refer to Houyi or Chang’e as having previously been immortals and initially present them as mortals instead. There are also versions of the story in which Houyi was made king as a reward for killing nine of the suns and saving the people. However, King Houyi became a despot who either stole a pill of immortality from the Queen Mother of the West or learned that he could make such a pill by grinding up the body of a different adolescent boy every night for a hundred nights. Chang’e stole the pill and swallowed it herself, either to stop more boys being killed or to prevent her husband’s tyrannical rule from lasting forever.